We all know about the rise to elite status of the Oregon football team. But have you ever heard of acrobatics and tumbling? If not, prepare to be impressed. Last year, I was working on a project and one member of my group had to leave to go to practice. Naturally I asked her friend what sport she competed in, I found out she was on the acrobatics and tumbling team. Like many of you, I wondered what the hell acrobatics and tumbling even was. The next day I asked her about the sport. She tried to explain it and I began to understand a little bit, but she said I had to attend a meet to really get it. So a buddy and I went to Matt Knight to watch the team a few days later. I was blown away instantly. The flips, the strength, the synchronization, all of it was extremely impressive. I was hooked and I didn’t miss a home meet for the rest of the year. Teams earn points for synchronization, technical execution, and steady feet at the base. The sport is impressive physically; there is no question about that. These ladies throw other girls up in the air, they flip and land perfectly, they stack up in intense pyramids and do multiple back handsprings in a row in perfect synchronization. With that said, what’s even more impressive is how good those lady Ducks really are at competing – I’m talking legit dynasty status. Really, a dynasty you might ask? 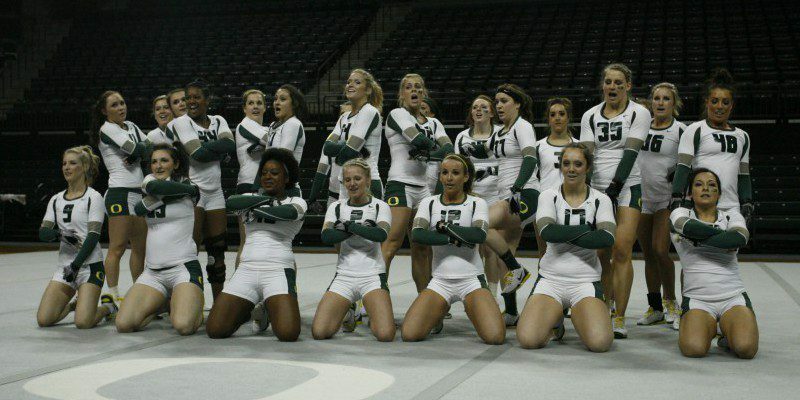 Well, since losing in the sport’s inaugural national championship in 2010, the Ducks have won four consecutive national championships, and were picked by the National Collegiate Acrobatics and Tumbling Association to win a fifth straight title this year. Talk about dominance. Can I get a Go Ducks?! The season is short for the acrobatics and tumbling team, lasting only seven regular season meets before the championships begin, so you have to see this powerhouse while you still can. The Ducks won their first meet of the season on February 4 on the road, but now the team is back in Eugene for their home opener tomorrow, Saturday February 21, at 6:30 p.m.. Admission is only $5, well worth it to watch an Oregon squad push for a national title. I’ve been witness to the dynasty first hand, get to Matt Knight and witness it for yourselves.